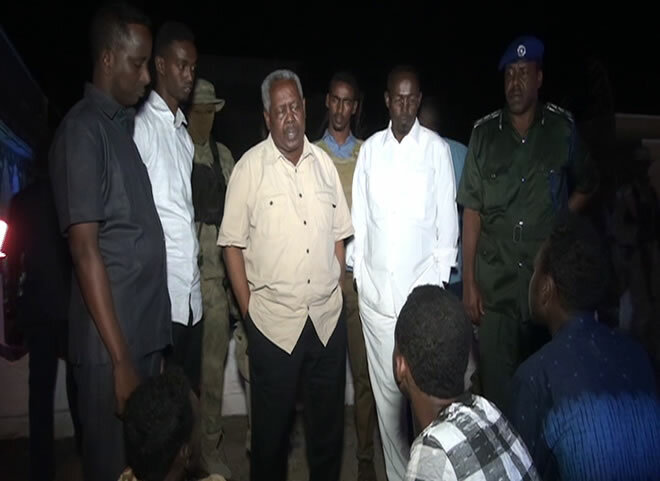 Major Abdullah Rageh, a Somali police officer, told ArmedPolitics over the phone that the gunmen infiltrated the Banadir beach restaurant after blasting their way through with a massive car bomb explosion on Thursday evening at 7:30 P.M. local time. Somali Firefighters worked to put out the flames of the car bomb blast (Photo: State Media). Banadir Beach restaurant, which is located near the Turkish Embassy in Mogadishu, was popular with government officials, Somali diaspora, and diplomats. Somali elite forces have responded, and engaged in a gun battle with the attackers for nearly eight hours in and around the restaurant building, killing two Al Shabaab gunmen, while capturing one alive. 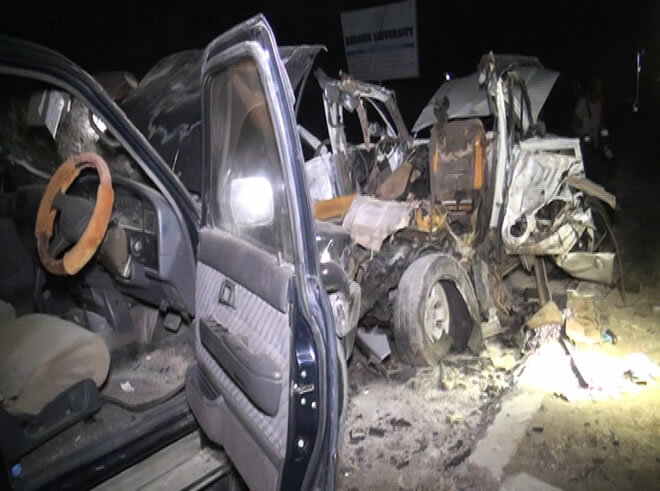 Al Shabaab’s spokesman for the terror operations told Radio Andulus, a broadcaster that supports the militants, that they were behind the beach front restaurant and killed several Somali government officials. 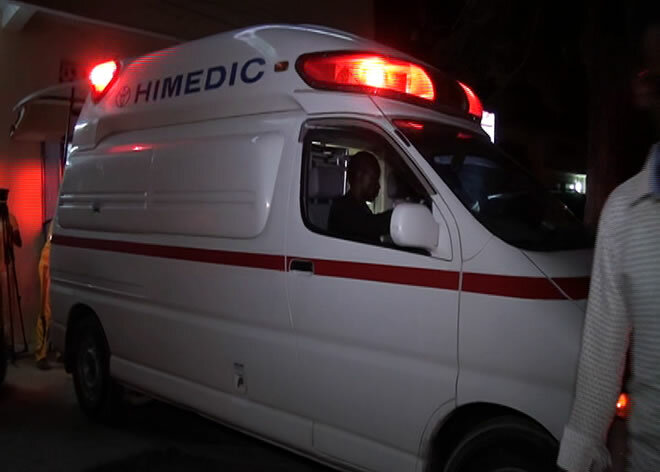 Ambulance at the scene of a bomb blast at Banadir beach restaurant taking wounds (Photo: State Media). 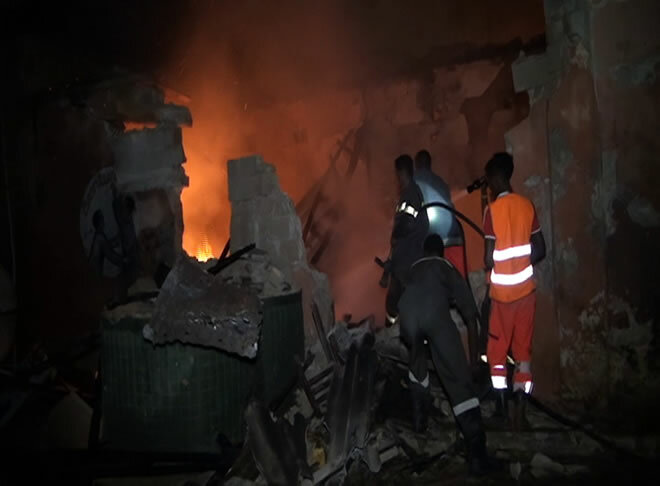 At least ten people – two attackers, five civilians, and three security force members were killed in the car bomb and the gun attack on Banadir beach restaurant in Mogadishu, according to the police officer. Those killed in the attack include two women who died in the car bomb blast at the gate, police said. Somali intelligence agency chief Gen Abdullah Gafow (centre) inspects site of attack (Photo: State Media). United Nations Assistance Mission in Somalia (UNSOM) has condemned the Al Shabaab attack on Banadir Beach restaurant in Mogadishu, and sent condolences to the families of victims. In January, Al-Shabaab carried out a similar raid on Beach View, a nearby seafood restaurant in Mogadishu’s Liido beach, and killed at least 30 people. It was a siege that lasted for 10 hours. On Sunday, Al Shabaab claimed two simultaneous car bomb attacks on local government headquarters and a crowded market in northern Galkayo city under the semi-autonomous state of Puntland. At least 15 people died in the bombings. Al Shabaab has vowed to continue such attacks in Somalia, as the Horn of Africa country is approaching a critical period of parliamentary and presidential elections due to be held in September and October, 2016.